This universally popular vegetable is one of the lily family's cultivated forms. The optimum season for fresh asparagus lasts from February through June, although it's available year-round in some regions. 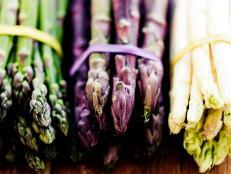 The earliest, most tender stalks are a beautiful apple green with purple-tinged tips. Europeans prefer white asparagus (particularly the famous French asparagus of Argenteuil), which is grown underground to prevent it from becoming green. White spears are usually thick and are smoother than the green variety. There's also a purple variety called Viola. 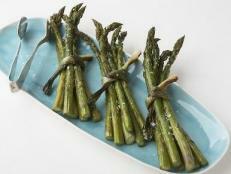 When buying asparagus, choose firm, bright green (or pale ivory) stalks with tight tips. 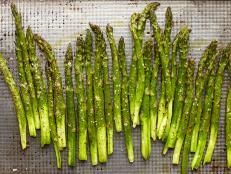 Asparagus plants live eight to 10 years and the spear's size indicates the age of the plant from which it came  the more mature the plant, the thicker the asparagus. It's best cooked the same day it's purchased but will keep, tightly wrapped in a plastic bag, three to four days in the refrigerator. Or, store standing upright in about an inch of water, covering the container with a plastic bag. 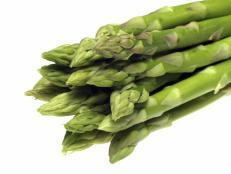 Asparagus is grown in sandy soil so thorough washing is necessary to ensure the tips are not gritty. 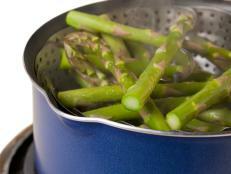 If asparagus stems are tough, remove the outer layer with a vegetable peeler. Canned and frozen asparagus is also available. 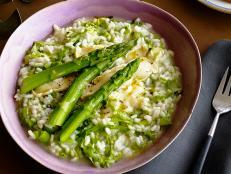 Asparagus contains a good amount of vitamin A and is a fair source of iron and vitamins B and C.
Transform classic risotto with seasonal asparagus. 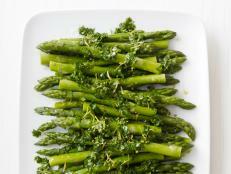 Celebrate the arrival of springtime produce with an impressive yet easy-to-prepare tart that lets fresh asparagus shine.